Bali Laka Leke Restaurant is situated behind monkey forest, Ubud. Laka Leke means "hideaway" in Balinese. It has green garden that is full of beautiful flowers, lotus pond and rice field. 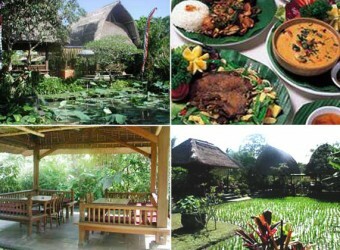 You can enjoy delicious dishes with ingredients from the restaurant's rice field and organic vegetables. Balinese dance show performed every Monday, Wednesday, Thursday, Saturday night. I had buffet while watching Kecak dance show which started at 8pm in Lakaleke restaurant. I made reservation of covered bale seating. I think it`s very cheap with all you can eat, if we like crispy duck. Kecak dance show was beautiful.